we are ready for the action. We are entering Holy Week, the week we prepare for the celebration of the passion and death of Jesus. It is the biggest week in the Church Year and any feasts that are to be celebrated this week are put off til after Easter. There is a reason for this: the Church calls on us to use every day of this week to get our hearts and minds into tune with what is going on. The readings at Mass come from Isaiah up to Thursday, and the gospel of John, for Monday Tues and Wednesday: they are constantly preparing us for the passion and death of the Lord. In this line we are given the person who is going to be involved in the conflict: the Gospel of John sets the timing and scene. From the previous chapter of the gospel we know that Bethany is only two miles from Jerusalem. We have the person, the chosen one of God, the place, Jerusalem, and the time, Passover week, we are ready for the action. The stage is set, the players have been announced. During the rest of Holy Week we shall watch the action unfold. Fra Angelico, who was born just outside Florence about 1395, has left us one of the most beautiful paintings of this holy scene. The angel Gabriel stands before Mary, who is seated with her arms folded beneath her breasts, and asks her to be the Mother of the Lord. Gabriel also has his arms folded and is leaning forward, his body language carries the signs of a person asking a favour, while Mary, who sits also in a very similar position, sits in contemplation. It is the wonder of this painting that the two characters, while in almost the same pose, portray completely different attitudes. Surely this must be one of the most beautiful feasts of the Church year, a day when we reflect upon the fact that God had to ask permission of a humble virgin to be born into the world. If the painting of Fra Angelico shows nothing else, it shows the massive respect that God has for human free will. He does not force himself or his will upon Mary, she is free to say no if she wants too. Fran Angelico is also able to convey this in his painting. So what should we reflect on today? This is the day that the whole process of the redemption of humanity began in this world, that God finally, after all the time from Adam to Jesus, decided to make his move. When you think of it: We are Christians because Mary decided to say Yes. If you look at it like that, surely this must be one of the most important feasts of the Church Year. let him first cast a stone"
In both readings this morning we have stories about women who are being condemned for their actions. The story from the Book of Daniel is one of lust and jealousy where two men try to destroy a beautiful young women because she refuses their advances. The second story from John’s gospel, is about the woman who was caught in the act of adultery. Here the motives of her accusers is different; this time they are trying to catch Jesus out and have something to use against him. Jesus plays a very shrewd game; knowing what they are really at, Jesus turns the whole thing round on them and says that the man with no sin can throw the first stone. Of course no one is without sin so no one can throw that first stone. 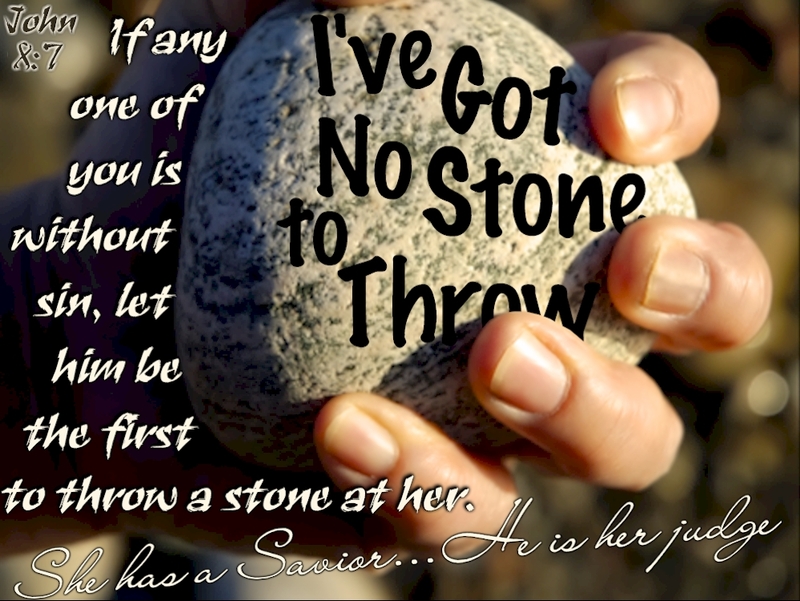 The unfortunate bit for us is that Jesus is without sin so when we meet him, he can throw all the stones that he wants! The important point in the stories is the intervention of God to give justice. God’s justice is one of the greatest truths of heaven. Before any person enters the gates of heaven then everything in their lives has to be cleared up to the standard of God’s justice. ‘We will never get in’ is the proper response to that. Fortunately, God’s mercy is also part of his justice: without it they would be stoning us for eternity! This is exactly the problem with us today. In fact it is the eternal problem of human nature: we don’t want to listen to God because we think that putting ourselves under the authority of God will diminish our freedom. When we listen to the voice of God he usually asks us to do something in our lives that helps others, be that wash the dishes or be pleasant to someone we don’t like at work. What we don’t realize is that if we listen to the voice of God our relationship with him and others changes and we grow into a much deeper level of life. God has a plan for us but we think we know better. We always believe that the new car or house is the thing that shall finally make us happy but then when we get it we realize that we are as far back as ever, we are not content. Then when we do an act of love we get great satisfaction, we feel fulfilled and we have a deep sense of wellbeing. What is it about human nature that we keep falling for the illusion that outside things can make us happy? We never seem to learn and yet we are all in the pursuit of happiness and the world mocks the way of happiness that God lays out for us. Strange, God say plainly that he will be our God and we shall be his people, and yet we don’t want to enter into the deal. We prefer the illusion of god, (fast cars, big house) to the reality of God, a deep meaningful life. Oh what fools we are! Azariah is in a bit of a situation: he has been placed in the middle of a fire by one of those Old Testament kings with an unspellable name. He is in the fire along with Daniel. What else can he do but pray? Azariah is in a hotspot but he is trusting in the Lord, his faith remains strong and he does not doubt that God can remove him from the fire or keep him safe in the middle of it. What happens to us when we are in trouble is that we usually tend to lose faith and forget that the Lord is master of all: ‘he cannot help us now,’ is our default mode of thinking. If we try to hold on to faith right through to the end then we often see God’s work in all its glory, when we lose faith and panic, then the eyes of our heart are closed to the work of God. He still does the work but we can’t see it. Eventually we do come to understand that God was there all along. We call this ‘hindsight’ but poor old Azariah was not in the position to wait for hindsight. If it was us we would all have probably died in a torrent of fire, overcome by fear.